As I listened to Houston recount his team’s experiences on K2 so many years ago, their harrowing rescue attempt to save the life of teammate Art Gilke, and the dramatic arrest of the falling team by Pete Schoening, I couldn’t help but think of my good friend Dave Hahn and the climate on Everest these days. 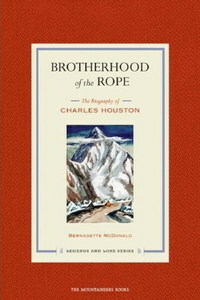 Last night, at the American Mountaineering Center here in Golden, Colorado, I was fortunate enough to see a presentation on the life and climbs of Dr. Charles Houston and his new biography, The Brotherhood of the Rope, written by Bernadette McDonald and published by The Mountaineers Books. I have written a bit about the concept of the brotherhood of the rope recently on this blog, and David Zinger has some great pieces on his blog as well. Much has been written about the tragedy of David Sharp’s death on Everest last spring, and the stunning survival of Lincoln Hall several days later. Sadly, the events that continue to unfold on the mountain – and on other peaks – have cast somewhat of a negative shadow on the climbing world, casting climbers as a callous lot seeking self-fulfillment at the expense of all else. This may indeed be true of some, but it is not indicative of the whole any more than the unethical acts of the Enron’s of big business are representative of business as a whole. On Sunday night, after reaching the summit of Everest for an amazing 9th time, my good friend Dave Hahn and Phinjo Sherpa came upon Usha Bista, a fallen member of the Nepal Democratic Team expedition. She was unconscious, clinging to life through a haze of high altitude cerebral and pulmonary edema at 27,500 feet. Tired, exhausted, but not swayed, Dave and Phinjo immediately went to work, dragging Usha downhill, administering first aid and medication as needed. It was undoubtedly a heroic effort, and resulted many hours later in getting Usha to the tents of a medical expedition at Camp III on the Lhotse Face. Simply put, without Dave and Phinjo risking their safety to help, Usha would be dead today. Period. Do Dave and Phinjo deserve a medal? Perhaps. Dave earned the David A. Sowles Award in 2001 along with other members of our 2001 Mallory & Irvine Research Expedition for a heroic rescue high on Everest that year. However, Dave and Phinjo did not stop to help Usha with the hopes of getting recognition. They did not do it for a pat on the back, articles in the papers, or an interview on CNN. Rather, they did it for Usha. They did it to save a life. They did it, simply, because it was the right thing to do. Back in 1953, Charles Houston and his team struggled against the odds to bring Art Gilke down K2. Things looked grim. The outlook was not good, and the risks were huge. In their attempt the entire team nearly died. But, as Houston said last night in his lecture: None of us, not a single one, could have left Art there on that mountain. We were a team, we did this together or we didn’t do it at all. Dave and Phinjo, Houston and his team…it is the Brotherhood of the Rope at work. For those of you interested in reading more about the ethics of Everest and the events on the mountain this year, please visit these great sites: The Adventure Blog, The Adventurist, and Alan Arnette. It is disappointing you did not mention Meagan McGrath who started the chain of assistance that saved Usha life. A disappointment that you focus only on the people you know. Thanks for your comment. I understand your comment completely, and I did not intentionally leave out Meagan McGrath’s heroic efforts or her part in the rescue. If you notice that I posted my article on May 25, and then run a search on “Meagan McGrath” and “usha bista”, you will see that this news came about after my article was posted. Simply put, the information was not available at the time of writing, at least not in the sources I saw. That said, I appreciate your comment, and hope you understand my position as well.